The state's new marijuana-tracking system has been dogged by problems since its launch last Thursday. Over the weekend, the system was hacked, and shipping information and other data were stolen, the state reported a week after its launch. The state’s new pot-tracking system was hacked last weekend, and an “intruder” stole route information associated with four days of marijuana deliveries, as well as other information. The state on Feb. 1 transitioned to a new marijuana-traceability system, Leaf Data Systems, which has been dogged by problems since its launch. The technology issues have kept marijuana growers and sellers scrambling to keep their businesses running. Some have worried about keeping marijuana on increasingly sparse store shelves. Problems associated with the hack were discovered Saturday by MJ Freeway, the company providing the data service and pot-tracking software. On Monday, the company identified the problem as a “possible security incident” and notified the LCB, according to a message that went out to all marijuana licensees Thursday. At that point, the LCB contacted the Washington State Office of CyberSecurity, which is investigating the hack. Smith said marijuana businesses were not notified of the attack until Thursday because of that agency’s protocol. The security flaw was resolved on Monday, Smith said. The state agency plans to continue using MJ Freeway as a vendor. In addition to transportation manifests, delivery-vehicle information like type, license-plate number and VIN number were also taken. That information is available through public-record requests, Smith said. MJ Freeway has had products hacked several times before, and source code for some of its software was posted online last year, according to Marijuana Business Daily, an industry publication. Pot proprietors Thursday questioned the LCB’s selection of MJ Freeway, considering its previous breaches. “It’s been a pretty well-known fear: MJ Freeway was not Fort Knox. Boy, was everybody right straight out of the gate,” said Steve Lee, who owns two marijuana businesses and is a Kennewick city councilman. Marijuana-traceability systems were designed, in part, to help regulators satisfy Obama-era federal guidelines about marijuana diversion. If pot could be tracked, the theory went, then federal officials would have more assurances it wasn’t crossing state lines or going into the black market. Lee said the hack has eroded the traceability system’s integrity, and will have him sleeping less easy about federal involvement in the state’s legal marijuana market. “It’s a catastrophic failure at the state level, and it leaves us all worrying about our futures,” he said. What the hacker(s) were after is not immediately clear, but pot proprietors worried that data could be manipulated. “If somebody can get in and read the data, they can also write (code) to it. They can disrupt the entire industry. That opens up corporate blackmail,” said Logan Bowers, co-owner of Seattle pot shop Hashtag. Bowers worked in software for about 20 years before opening his store. Even with the hack issue resolved, pot proprietors said the industry is not running at full speed because of myriad other tech issues during the state’s transition to Leaf Data Systems. Bowers said his store was only able to get three of six scheduled shipments Thursday, and most of the vendors he buys from are not able to deliver marijuana yet. Jeremy Moberg, a marijuana grower in Okanogan County, said the state should return to the contingency system it had been using for several months during a gap in service from traceability vendors. The state was supposed to transition to a new data system last November, but that was delayed after the company initially selected for contract negotiation by the LCB withdrew from consideration. 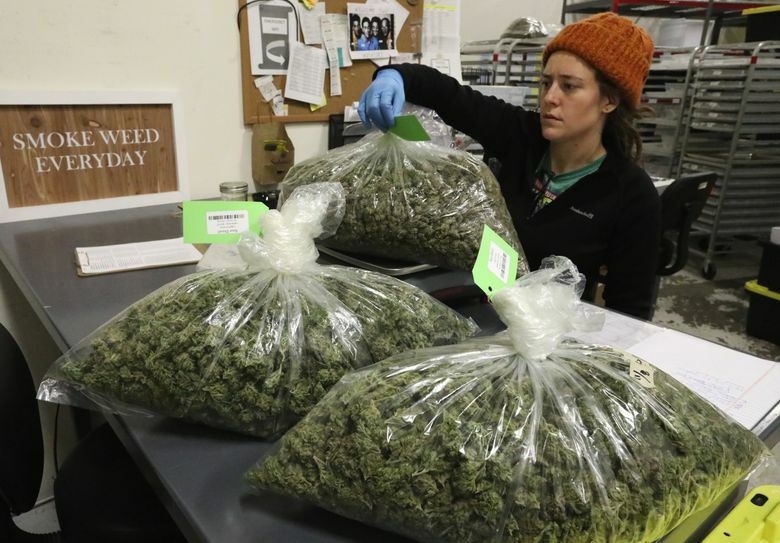 For the last three months, pot businesses have been submitting thousands of spreadsheet files each week to the LCB with their traceability data, a cumbersome, manual process.